Successfully Added Smartphone OTG Endoscope Camera - USB, Ultra Thin 5.5mm, 6 Adjustable LED Lights, VGA 640x480 Resolutions to your Shopping Cart. Portable Smartphone Endoscope with 2 meter lead lets you capture 640x480 images directly on your Smartphone or tablet. You don't need to spend a fortune to on expensive bulky endoscopes as this light weight compact endoscope works with many OTG enabled Smartphone and tablets and is the perfect addition to your toolkit letting you access difficult to view areas with ease. Want to work on the car, search behind cabinets, check pipes for leaks or blockages, trace cabling or investigate electrical equipment? Well with this inexpensive OTG endoscope it's never been easier. The two meter flexible endoscope can go around corners and reach areas that other cameras can't access. With its 5.5mm camera head this USB endoscope is exceptionally thin letting it negotiate even the tightest of spots. The cameras 640x480 resolutions bring a great view back to your tablet or phone so you needed be near a computer or carry around extra viewing equipment as this endoscope can work directly with a wide range of phones and tablet PCs. 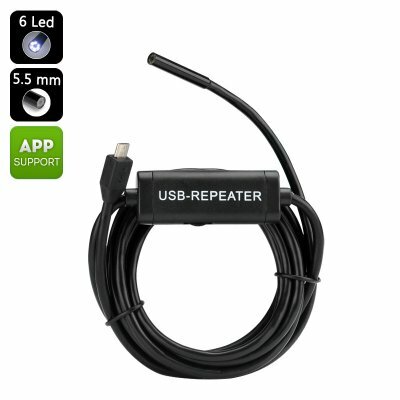 This USB endoscope comes with a 12 months warranty, brought to you by the leader in electronic devices as well as wholesale gadgets and tools..
Small and easy to set up (when you read the instructions). Waterproof so great for checking drain pipes. None that I can see so far.